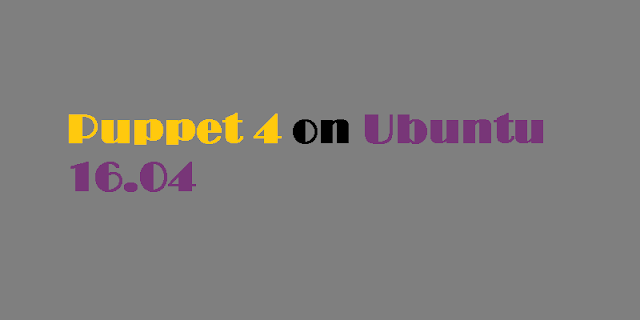 This guide will walk you through the steps to install open source Puppet 4 in a master-agent setup on Ubuntu 16.04. Through the Puppet master server which runs the Puppet Server software you can control all other servers, called Puppet agent nodes. To follow the steps mentioned in this article, you will need three Ubuntu 16.04 servers installed on either (physical or virtual) machines, each with a non-root user with sudo privileges. If you want manage larger infrastructures, the Puppet master will definitely require more resources. The remaining two servers will be Puppet agent nodes, managed by the Puppet master. We'll call them dbserver1 and webserver1. When these three Ubuntu 16.04 servers are in place, you're ready to begin. Puppet master servers and the nodes they manage need to be able to communicate with each other. In most situations, this will be accomplished using DNS, either configured on an externally hosted service or on self-hosted DNS servers maintained as part of the infrastructure. DNS is its own domain of expertise, however, even on hosted services, so in order to focus on the fundamentals of Puppet itself and eliminate potential complexity in troubleshooting while you're learning, in this article we'll use the /etc/hosts file instead. Press Y to proceed. Once installation is complete, and before we start the server, we'll take a moment to configure the memory. Next, we'll start Puppet server. Dec 07 16:27:33 puppet systemd: Started puppetserver Service. With the server running, now you're ready to set up Puppet Agent on our two agent machines, dbserver1 and webserver1. The Puppet agent software must be installed on any server that the Puppet master will manage. In most cases, this will include every server in your infrastructure. Now that both agent nodes are running the Puppet agent software, we will sign the certificates on the Puppet master. The first time Puppet runs on an agent node, it sends a certificate signing request to the Puppet master. Before Puppet Server will be able to communicate with and control the agent node, it must sign that particular agent node's certificate. To sign a single certificate request, use the puppet cert sign command, with the hostname of the certificate as it is displayed in the certificate request. The Puppet master can now communicate and control the node that the signed certificate belongs to. You can also sign all current requests at once. Now that all of the certificates are signed, Puppet can manage the infrastructure. Puppet uses a domain-specific language to describe system configurations, and these descriptions are saved to files called "manifests", which have a .pp file extension. We'll create a brief directive to verify that the Puppet Server can manage the Agents as expected. By default Puppet Server runs the commands in its manifests by default every 30 minutes. If the file is removed, the ensure directive will cause it to be recreated. The mode directive will set the file permissions, and the content directive add content to the directive. We can also test the manifest on a single node using puppet agent --test. Note that --test is not a flag for a dry run; if it's successful, it will change the agent's configuration. Repeat this for webserver1 or, if you prefer, check back in half an hour or so to verify that the Puppet master is running automatically. Note: You can check the log file on the Puppet master to see when Puppet last compiled the catalog for an agent, which indicates that any changes required should have been applied. We've successfully installed Puppet in Master/Agent mode.